I feel so bad. I haven't been blogging, but its been a crazy, busy month. My brother and sister n law had their 3rd baby. He was premature, but he's doing AMAZING and my sister n law is doing AMAZING as well. My mother flew in from back home and has been here for a month!! Let's just say that it's been FANTASTIC having her here. My father flies in to pick her up on Wednesday and they leave Saturday morning. (( Bummer )) I will say that I'm very thankful that my mother was able to be here for so long. 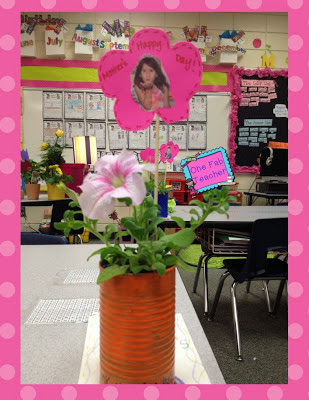 With that said, last week my firsties and I turned some trash into treasures. I asked for them to bring in an empty can (cleaned out). 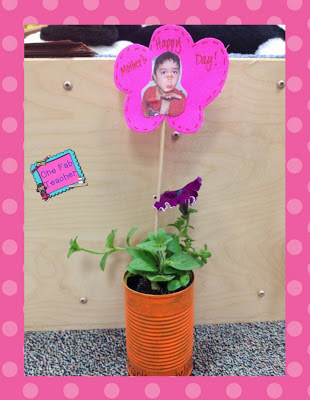 We painted the can with acrylic paint, filled it with soil, and flowers, and lastly I took a picture of each one of my kiddos blowing a kiss to their mommy, printed those off and glued them on a stick that went inside the pot. I also, had them decorate a bag for their beautiful present to go inside. I'm sure I had many firstie mommies very happy this morning. I must go now, but I wish all of you mother's a Happy Mother's Day! 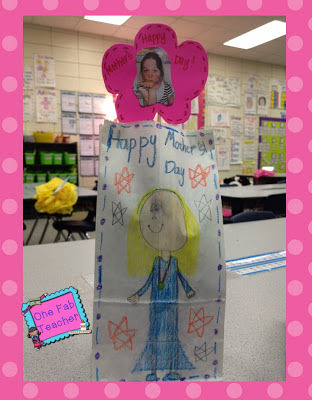 I'm not a mommy yet, but I consider myself a teacher mommy.